In part 12 of our Catechism Series with Pr. Joe Abrahamson, we discuss the Daily Prayers part of the Catechism. How do we live out the teaching that God gives us in the Commandments, the Creed, and the Lord’s Prayer? We pray. Daily. Join us as we discuss how to pray according to God’s Word and in our home and family settings. In this latest installment of our Catechism Series with Pr. Joe Abrahamson, we continue discussing the Sacrament of the Altar. Pr. Abrahamson shows us how Jesus’ new covenant meal fulfills the old covenant, and we smack down the false teaching that the Lord’s Supper is only a symbol, or reminder, of God’s salvation. This is a transcription of J.S. Bach's setting for P. Nicolai's Wachet Auf. 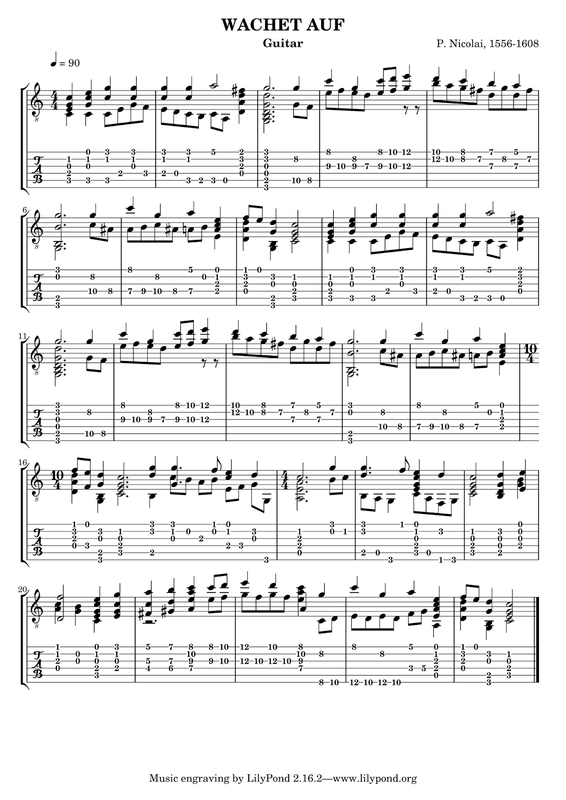 This particular setting is used for Hymn 544 in the Evangelical Lutheran Hymnary "Wake, Awake, for Night is Flying." A slightly less complex transcription of Wachet Auf is used for ELH 518 "Rise! To Arms! With Prayer Employ You." To claim God said something when He did not, or to deny that God said something when He did is to take the Name of God in vain. To present things as godly and beneficial for the faith which have no promise or word from God is also taking God's name in vain. This happens when people try to demonstrate that something they think is good, so God would like it, and since God likes it it must be good for you. All of this misuse of God's name and reputation is what the word blasphemey refers to. And it is frightening how casually it is done and how sincerely it is meant. The FiveTwo network has fallen into this kind of casual misuse of God's name. "Influence doesn't simply come from position or title, start being in relationships with those around you." "Leaders, if you want influence, start with relationship." Perhaps Confessional Lutherans are not familiar with John C. Maxwell, but most of the rest of Mainline American Evangelical Christianity is. Maxwell is a widely established pop-Christian/Business author with more than 60 published books. A large portion of those books deal with leadership. He was a frequent guest preacher at the Crystal Cathedral on Schuller's Hour of Power. The point is that it is not hard to look him up--AND most evangelicals wouldn't have to, they would recognize his words right away. Me: That would be John C. Maxwell. What is astounding in the above exchange is not that FiveTwo denied that there was influence by Maxwell. Whatever, maybe the FiveTwo guy didn't really remember which person it came from. But then again, FiveTwo has a history of making statements that come from others as if they are original. Really!?? I've seen all kinds of this junk in Evangelical Free circles. They generally have no problem attributing their thoughts to Jesus. But FiveTwo was claiming to be a Confessional Lutheran group--well, maybe saying that is a stretch. They actually are removing the word Lutheran from most of their stuff. And they have taken the focus off the Means of Grace and placed it on the individual Christian as an embodiment of Christ to the world. What they call a "sacramental entrepreneur." We've looked at how they cobbed that title from the failed efforts of the Emerging church and the Social Entrepreneurs in a previous article. Back to the issue: FiveTwo claims Jesus said the words or taught the meaning of the words in the motivational poster and around it! Which translation of the Bible is that in? What passages, which context? After all, if one is to claim God said something, one actually ought to be able to go to the written word of God and show where He actually said it. But FiveTwo couldn't. They deflected the question and went to the Emerging Church method of Bible interpretation. Take something in the Bible that is descriptive, find some principle embedded in it, and tell people that if they do this then they are following Jesus. FiveTwo: Joe, Jesus spent time with people, building relationships with them, demonstrating His love for them. That love and presence definitely influenced their lives. There is no direction toward any specific context of Scripture. This is just a vague appeal to the general knowledge of the reader. 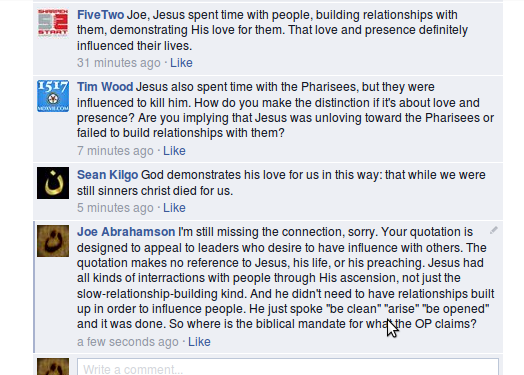 And people maybe want to think that Jesus would want to spend all kinds of time building relationships with them. But aside from a few, very few people, Jesus didn't really spend a lot of time with a whole bunch of individuals. He didn't spend a lot of time getting to know them or any such thing. Tim Wood's response is direct to the point. He is right. 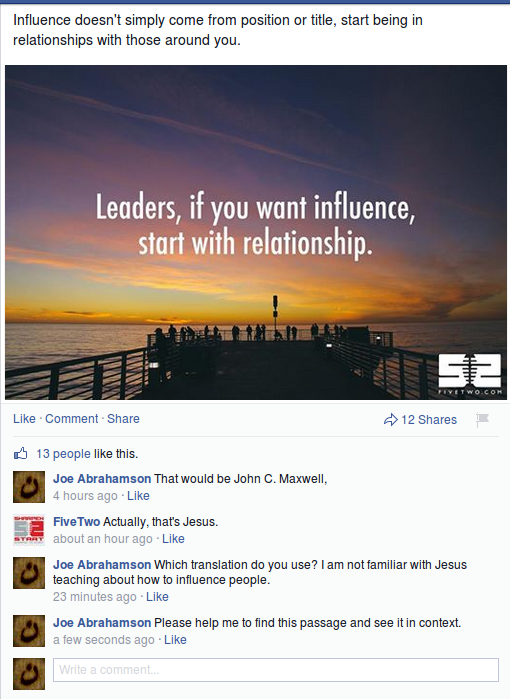 The consequence of FiveTwo's words here is promoting a false doctrine of justification by relationship. FiveTwo has fallen into the Reformed false doctrine of Faith and salvation as a relationship rather than God's verdict on account of Christ's life, death, and resurrection. But did you notice that FiveTwo didn't answer my question? They merely diverted attention away from the question. So I tried to bring the question back into focus. Me: I'm still missing the connection, sorry. Your quotation is designed to appeal to leaders who desire to have influence with others. The quotation makes no reference to Jesus, his life, or his preaching. Jesus had all kinds of interractions with people through His ascension, not just the slow-relationship-building kind. And he didn't need to have relationships built up in order to influence people. He just spoke "be clean" "arise" "be opened" and it was done. So where is the biblical mandate for that the OP claims? 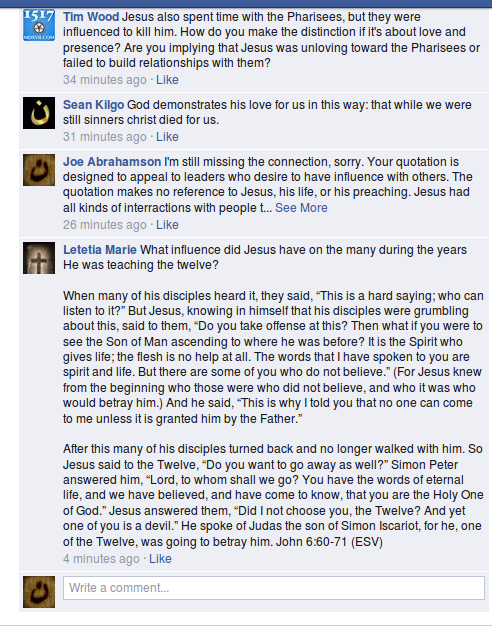 Another reader: Letetia Marie pointed out another Bible example that showed the OP was not really what Jesus taught. Notice the time stamps above: 34 minutes ago down to 4 minutes ago. That brings us to the next. Note the time stamps: 17 hours ago. 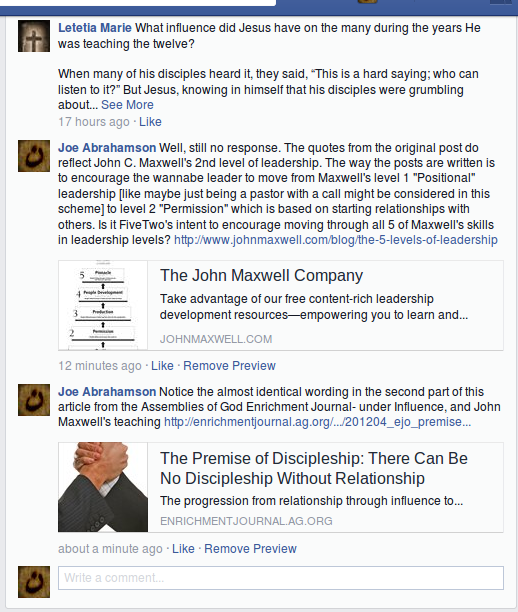 After the big lapse in time I posted the references to John C. Maxwell's works where the words and sentiments in the OP were to be found. Shortly after demonstrating what the real source was the FiveTwo network banished me and expunged all my comments from their Facebook Page. It is their FB page. They can choose what goes on it and what does not. But it is important for the wider audience to be able to know what kinds of things they are deleting. The pattern of deletion shows a casual disregard for the Word of God, the consciences of those who wonder whether FiveTwo's claims come from God or are just human, and a serious rejection of the use of Confessional language. If, as they claim, FiveTwo's goal is actually to get people involved in the Sacraments, be Baptized, and attend the Lord's Supper, they hide these goals pretty well from people reading their website and facebook page. FiveTwo doesn't have much patience for people who ask where in God's Word the FiveTwo philosophy or methods are taught. They have two responses: divert to some other issue, or delete. Comment Deleted by FiveTwo within minutes of posting. Comment Deleted by FiveTwo shortly after Randy Yo posted. FiveTwo doesn't have any patience for people who bring up the Lutheran Confessions in an effort to correct or understand what FiveTwo is claiming. Not supposed to ask this question. Comment deleted. Can't ask about the Lutheran Confessions. Comment Deleted. Volumes of Patrologia Orientalia available at the Internet Archive.